On February 14 this year, a car bomb struck a convoy of the Indian Central Reserve Police Force in Pulwama, Kashmir, claiming nearly 50 lives. While much of the international news coverage focused on geopolitics, the attack at Pulwama represents yet another data point in the larger history of contested Muslim citizenship in India. Indian Muslim responses to the attacks at Pulwama reveal a much larger and more complicated process by which Indian Muslims not only mediate their own citizenship but carve space for themselves within the nation. This historical inequity has arguably existed since the inception of the Indian state, but the effects of this phenomenon are more clearly pronounced under Prime Minister Narendra Modi’s right-wing Bharatiya Janata Party. In Modi’s India, Muslims are called on to prove their fealty to India. In some ways, their existence hinges on proving that they are not loyal to India’s western neighbor, Pakistan. The question is not so much equality, as much as it is equity — Hindus are born and considered to be Indian; Muslims are born and considered to be foreign subjects who must become Indian. The systematic marginalization of Indian Muslims creates the perpetual ‘performing Muslim,’ a performance that becomes critical in times of geopolitical conflict with Pakistan, India’s historical adversary. Just one day after the Pulwama attack, Muslims in Mumbai took to the streets as part of an organized demonstration against Pakistan. As they burned Pakistani flags and effigies of Pakistani Prime Minister Imran Khan, Mumbai’s Muslims not only sought to appease the nationalist demand of championing the cause of the nation in times of crisis, but through this performance, sought to prove that they too were equally infuriated by Pakistan’s support of terror, and thus were equally Indian. Just a mere three days after the attack in Kashmir, the All India Muslim Unity Front published a memo in which they wrote “there is no place for terrorism within Islam.” To be clear, there is nothing wrong with such a statement, nor is there anything wrong with Indian Muslims expressing their agency; in fact, this is urgently demanded. What is problematic, however, is the nationalist expectation placed on Indian Muslims to prove loyalty, without which any claim on “Indian” as a marker of identity is prohibited. Another example that is equally revealing is the India Today article titled “Agra Muslims support ban on Jamaat-e-Islami, condemn Mehbooba Mufti’s comments.” Following the attacks at Pulwama, the government moved to ban the Kashmir-based Islamist social organization Jamaat-e-Islami, prompting strong criticism and outcry from the former chief minister of the state, Mehbooba Mufti; Omar Abdullah, also a former chief minister of the contested state; and Muslim Kashmiris, who view the banned group as a social and cultural organization as opposed to an outfit that engages in militancy. The strategic use of Agra Muslims as opposed to the Muslim chief minister’s criticism of the Modi government not only propagates the duality of “good Muslim” and “bad Muslim,” but further cements the notion that the “good Muslim” is one who not only acquiesces to the ruling regime, but enthusiastically champions it, placing his aspirational nationhood over his religion. The opposition of Agra Muslims to the former chief minister’s comments also reveals the degree to which Indian Muslims have internalized right-wing nationalist rhetoric. Agra-based social activist Amir Qureshi, himself a Muslim, chastised the minister for supporting so-called “anti-nationals,” a loaded term now assigned to those who either question the ruling regime or act in ways that are deemed anti-Hindu. After the Pulwama attack, documented cases of discrimination and assault on Kashmiris came to the forefront. Despite widespread condemnation from India’s liberal elites, Modi took nearly 10 days to condemn violence against Kashmiris residing in India, leading many to believe that the prime minister was not concerned with preventing violence against mostly Muslim Kashmiris. The failure to directly condemn violence was read as part of a larger political strategy which involves staying silent in the face of communal violence in order to satiate the country’s Hindu right wing. In some sense then, today’s political climate produces a sense of urgency within Muslim consciousness to eagerly prove to the nation that they too are part of the national fabric. For segments of the country’s Hindu population, Muslim loyalty to the nation has always been suspect. Among right-wing Hindus, the dominant view holds that true inhabitants of the subcontinent are Hindus (and followers of other religions birthed in India such as Sikhs and Buddhists). Through this schematization, religious identities like Christianity and Islam become ‘foreign’. With regard to Islam, the movement for Pakistan and the subsequent partition of British India embedded within the Hindu imaginary that the Indian Muslim subject was ‘secretly’ loyal to Pakistan. 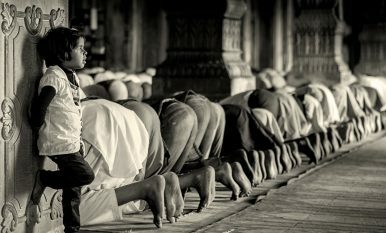 The perception of India’s Muslims as a fifth column continues to this day as accusations and conspiracies regarding the demographic groups’ support for everything from the Pakistani cricket team to Pakistan as a concept — and thus for an Islamic Republic — circulate among right-wing Hindus, and increasingly among the mainstream Hindu population. This psycho-social anxiety placed on India’s Muslims has in some ways been exacerbated by Pakistani elites, who often make use of the treatment of Indian Muslims as talking points against the Indian state. Pakistani leaders from Pervez Musharraf to Imran Khan often attempt to criticize India’s treatment of minorities and act as the spokespeople for India’s Muslims, often for domestic purposes of legitimizing a Sunni Muslim hegemony co-opted by the country’s deep state. A symbiotic hijacking of the Indian Muslim voice by right-wing Indian Hindus and Pakistani elites comes at the expense of Indian Muslims, who find themselves trapped between right-wing Hindu chastisement and insincere displays of solidarity by fellow coreligionists, placing additional pressure on Indian Muslims to ‘perform’ rituals of loyalty to the nation. The purpose of this article is not to suggest that Indian Muslims are insincere in their condemnation of terrorism or even of Pakistan. What is important to glean from our argument is the visceral effect majoritarianism generally, and increasingly, Hindu nationalism specifically, has on Muslim behavior, and more broadly, Muslim claims on Indian citizenship. While Muslim citizenship in post-colonial India has always been a historically tumultuous issue, the newfound prominence of the right-wing BJP and its extrajudicial allies in the Sangh Parivar add a layer of urgency on the Indian Muslim — fueled in part by fear ­— to prove his right to belong in the nation. As the Modi-led government prepares for a contentious election, it will rely on a tried and tested policy of communal politics, an intrinsic component of which is demanding citizenship tests for Muslims and other minorities. A significant portion of north India’s Hindu middle class strongly supports the ruling government, so a turn to communal politics is a sound approach in light of floundering economic policies. Certainly claims of citizenship by Indian Muslims have always been considered tenuous by a segment of India’s Hindu population, but as a new and increasingly frightening era dawns in democratic India, there is an urgent need to protect Indian democracy and with it, the aspirational secularism it created. In light of already contested claims to Muslim citizenship, secular activists, religious leaders, and policymakers should not only enthusiastically champion the cause of inclusivity, but should not expect — or demand — performative displays of nationalism from a population that continues to be institutionally marginalized across all fronts. Expecting as such would be catastrophic for a democratic polity with increasing illiberal tendencies. Aman Madan is an independent observer of politics on the Indian Subcontinent. He was formerly a journalist for the Pultizer Center for Crisis Reporting. Hari Prasad is an independent researcher of Middle East and South Asian politics and security.